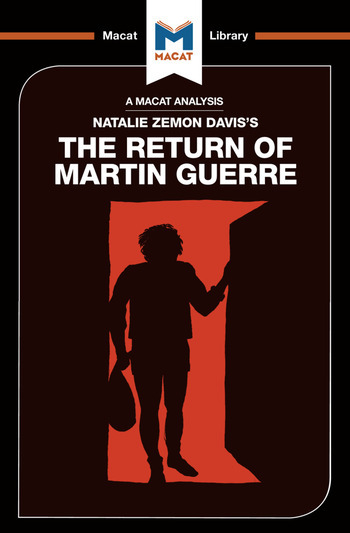 Few stories are more captivating than the one told by Natalie Zemon Davis in The Return of Martin Guerre. Basing her research on records of a bizarre court case that occurred in 16th-century France, she uses the tale of a missing soldier – whose disappearance threatens the livelihood of his peasant wife – to explore complex social issues. Davis takes rich material – dramatic enough to have been the basis of two major films – and uses it to explore issues of identity, women's role in peasant society, the interior lives of the poor, and the structure of village society, all of them topics that had previously proved difficult for historians to grapple with. Davis displays fine qualities of reasoning throughout – not only in constructing her own narrative, but also in persuading her readers of her point of view. Her work is also a fine example of good interpretation – practically every document in the case needs to be assessed for issues of meaning. Dr Joseph Tendler received his PhD from the University of St Andrews. He is a specialist in Historiography, the study of how history is conceived and written, and is the author of Opponents of the Annales School.